Leighann Fields, 16, of Folsom, Pa., who spent 2005 marching in her second season with the Crossmen color guard, sent in this one. 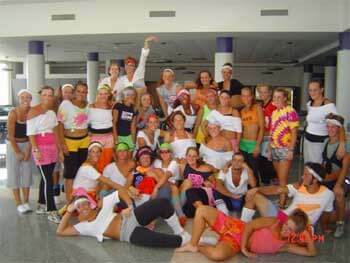 "This is the 2005 Crossmen color guard at our crazy 80's dance class. When we were at our housing site for DCI East we held that class, at which we dressed the part and learned the "Beat It" dance from the Michael Jackson video of the same name. "For our outfits we wore everything from cut-up T-shirts to uniform shorts, to my mom's drum corps tank top she bought back in the '80s. I have never ever been with a group of people I loved as much as I loved this color guard. Everyone got a long extremely well and with them I made memories that will last forever! Thanks Bones guard! And remember, inside every performer there is a beginner who fell in love." Thanks Leighann! E-mail your best shots from the summer to dave@dci.org along with where and when the photo was taken. Send some biographical information about yourself as well. We'll give you full credit. Also, let us know if you want your e-mail address included.